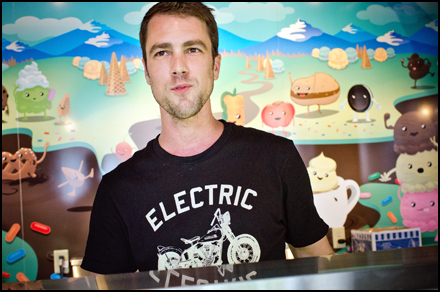 Luc Essiambre brings great ice cream to King West with Cool Hand Luc, which opened on June 3. Luc Essiambre is the latest entrepreneur to give King Street West a little scoop of happiness. 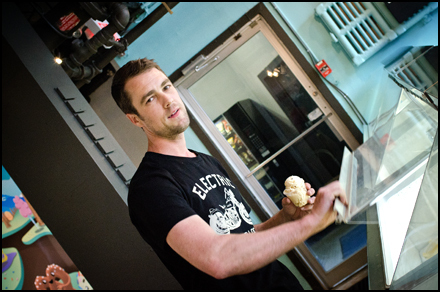 Last week, he started serving up ice cream at Cool Hand Luc, a lower-level shop a block and a half east of Bathurst that adds some wholesomeness to this clubby neighbourhood. He said he doesn’t drink alcohol, which meant that “at night the only people walking the streets were me and the homeless.” He opened Cool Hand Luc in the same building where he lives at 545 King West to give the area something different as well as a place everyone can enjoy. And who doesn’t enjoy ice cream? The grand opening on June 3 featured free tastings from his selection of premium ice cream, frozen yogourt and sorbet. Luc gets his ice cream from Bobcaygeon-based Kawartha Dairy, working with the distributor to deliver the flavours he wants. The ice creams are all-natural, gluten-free and come from fair trade ingredients, he said. The vegan-friendly sorbets come from a distributor in Montreal. “I worked in the ice cream business for six years, so I know what flavours sell,” he said after handing over a cone topped with a scoop of Wolf Paws (vanilla ice cream with chocolate butter fudge and brownie pieces … yeah, it was yum — and it’ll sell). Luc said he eventually will transition to making his own ice cream, but for now wanted to make sure he could get the best ice cream he could, which is why he went with Kawartha Dairy, a family-owned company that’s been around for 74 years. At Cool Hand Luc, a single scoop with a cone is $3.50, a double scoop $6.14 and a triple scoop $7.44. A kiddie scoop comes in at about $2.50. The store’s open daily from 11 a.m. til late, which is probably around 9 p.m. or so. In winter, Luc will offer soups, as well as keep some bins of ice cream around. Luc Essiambre keeps Cool Hand Luc open daily til 9 p.m. or later. DEATH BY CHOCOLATE: Chocolate ice cream with bittersweet dark chocolate chunks and thick chocolate twister sauce. GOLD MEDAL RIBBON: French Vanilla-flavoured ice cream folded into chocolate ice cream and swirled with Old English Toffee. KODIAK ISLAND FUDGE: Vanilla ice cream with chewy Talkeetna fudge pieces and swirled with Kodiak Island fudge. BLUE BUBBLEGUM: Loads of pink-coloured gum pieces in a bubblegum flavoured ice cream with a bright blue colour. BIRTHDAY CAKE: White cake icing-flavoured ice cream filled with rainbow chocolatey chips and a blue marshmallow ribbon. CARAMEL SNAPPERS: Caramel-filled chocolate turtles in toffee-flavoured ice cream twirled with thick English Toffee.